I just read a story from last year from a writer who said we should be embracing college football's recent trend to schedule games on Fridays because it means more college football viewing for the couch potatoes at home. This is a thinly-veiled excuse for lining TV's pockets and for trampling all over high school football's big night (believe it or not, college football couch potato, there are people around here who would like to go to a high school football game and watch Syracuse University play, but they can't, because college football has to take every day of the week for itself). And I've added it onto the pile of reasons why I can't be bothered with college football. This is the state of angst I enter every year at this time. Football season is beginning this weekend (or already has begun for you Thursday players) and I'm told I need to be ready. I am ready. But I am bracing, not welcoming. Football has become too much of a bother to be truly enjoyable. I'm a baseball guy, not a football guy and I've documented my issues with football in the past. But I do like watching NFL games and have watched them for 40 years. It's just that I can't deal with the sport in peace anymore. There are too many people that have infiltrated the NFL, from all sides, carrying their Causes, who think You. Must. Care. About. This. I don't need it. Remember Howard Cosell? Remember when he used to talk about things unrelated to the NFL game being broadcast and everyone -- everyone -- said, "Who is this guy? Get him off!" Well, it's now a vast interwebbed network of Howard Cosells, babbling about whatever they think is important and the game is incidental. Then there are the scary elements of the NFL, the publicizing of the debilitated lives of former NFL players. We never saw this stuff 20, 30, 40 years ago. 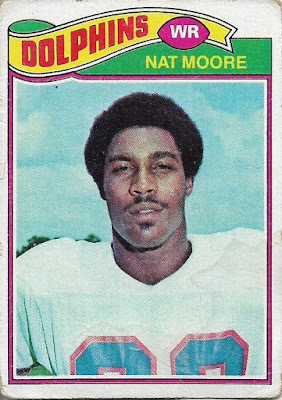 Former NFL players were making beer commercials then and having a great time. That's all we saw of them. We never saw walkers or wheelchairs or the muddled minds. Today, where I live, high school teams are having more and more difficulty finding kids who want to play football. I assume it's that way in a lot of communities, outside of the country's usual football hotbeds. Eight-man football, something that was once a relic of the '60s and '70s, is returning in a big way, because so many schools can't field a full team. What will happen to football? It's the one sport that I can see dying out in another generation or two. I still like the idea of watching the NFL. But football is just too difficult to watch these days, and I haven't even gotten to the pervasive commercials that have been an issue in the sport for more than a decade. This is not a great way to start the season. I must keep in mind the good times. There have been a few. As a Buffalo Bills fan, the years from 1986-94 were probably the golden age for me and football. 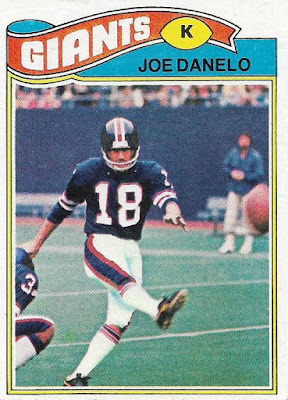 I lived in Buffalo for much of this period and the whole city followed that team, which made four straight Super Bowls (and lost 'em all). I made a number of friends purely through watching the Bills and some of the more notable games of that period will stay with me forever. I also covered the Bills during part of that period and that was fun, too. Yeah, it was stressful and periodically unpleasant. But thrilling. 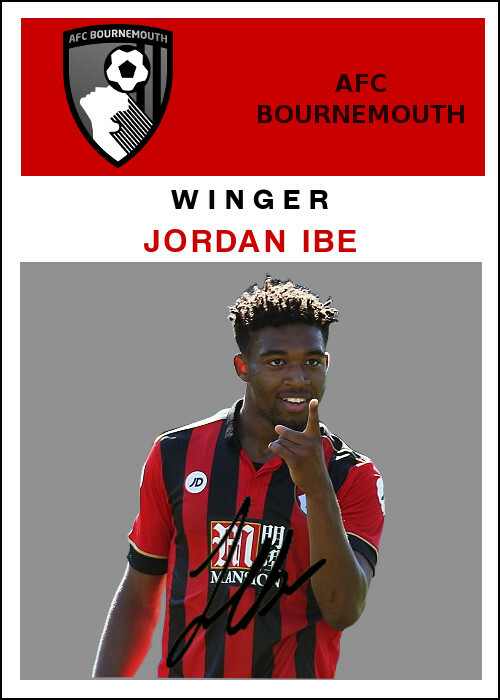 And, finally, collecting football cards. I didn't do a lot of that as a kid. It was more something to collect because I couldn't find baseball cards in the store anymore. 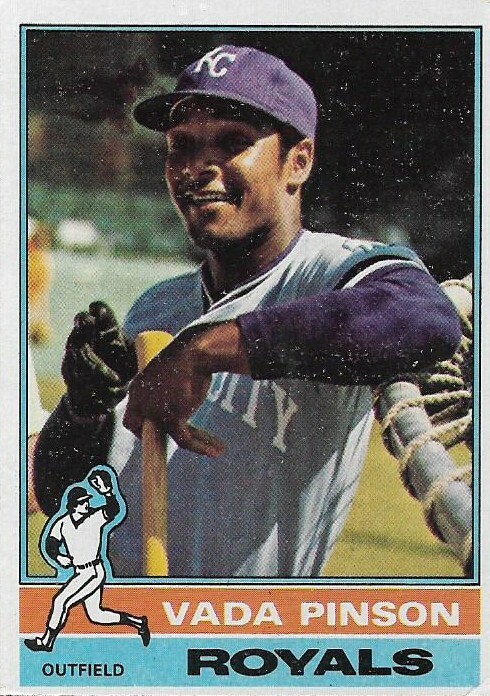 But I am nostalgic for those '70s cards, particularly sets from 1976 and 1979, and especially from 1977. 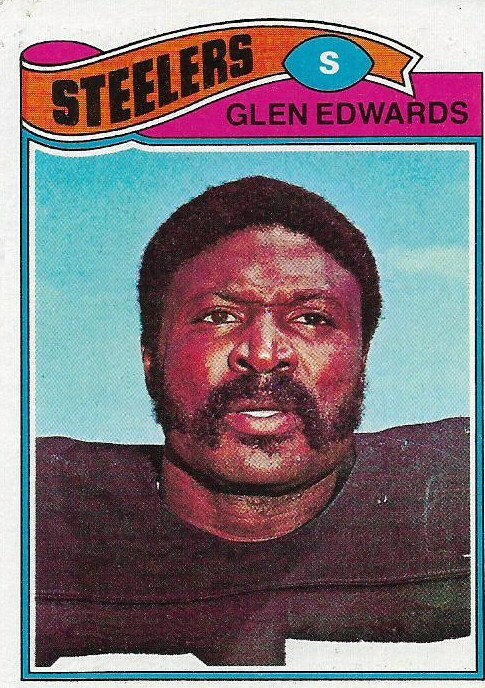 My want list for 1977 Topps football is still quite beefy. 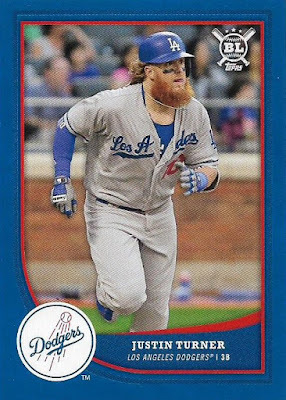 I don't focus on it much and don't receive many of the cards in trades often. 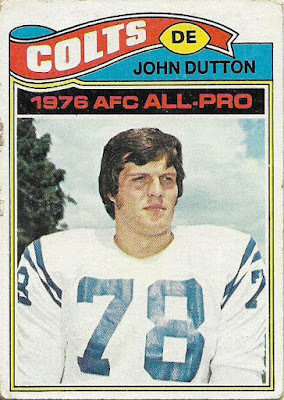 I did receive a handful of '77s recently from Chris, who I know from that same social media site that is all kinds of cranky about football. Let's see those cards. Because it's football season, you know. Head shots aplenty. Not the most exciting lot, huh? 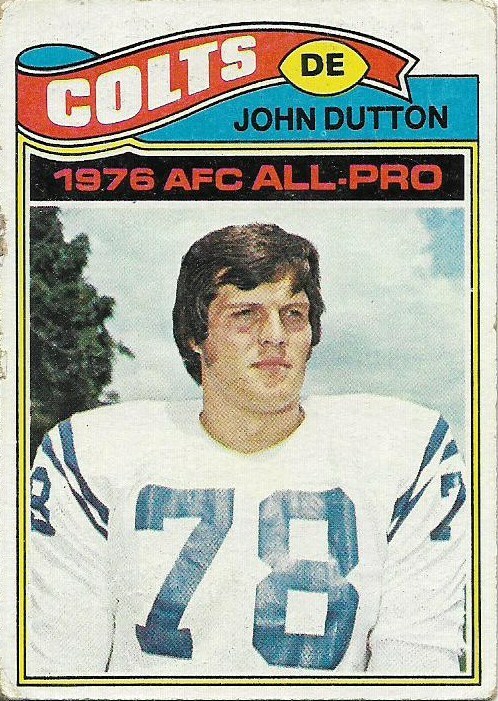 But it's always cool to get an All-Pro card from that set, loved those 1980 Topps baseball-esque All-Pro bars. I really like looking at that 1977 design 40-plus years later. Although, in a sign of how I can't enjoy football like I once did, I've already wondered whether these four guys are doing OK these days. 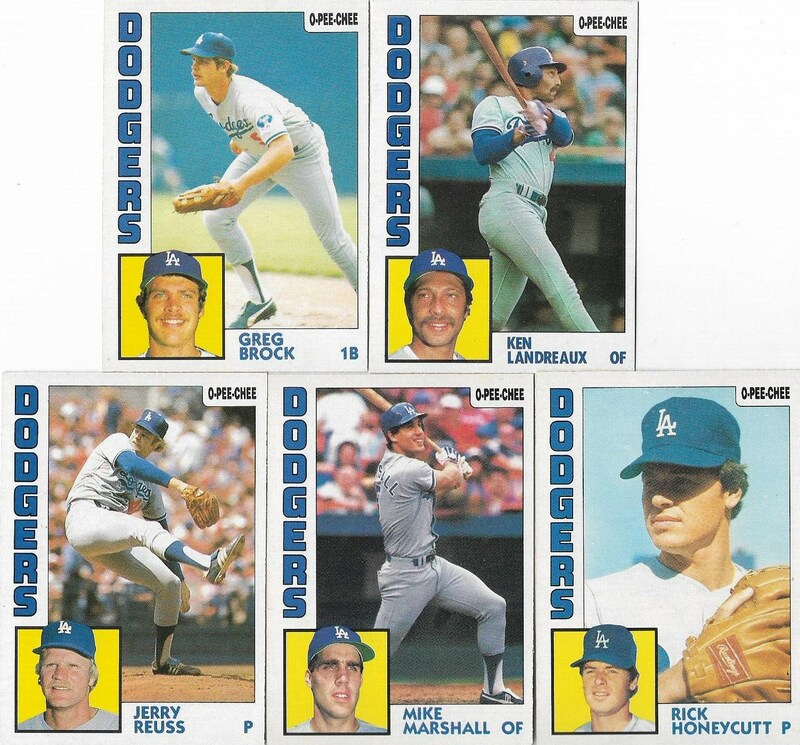 I had maybe five 1984 O-Pee-Chee Dodgers, and none of these were dupes! I love that. I didn't fare as well with the Gold Label that Chris sent. This was the only one I needed. Chris wasn't done with the Canadian cards, though, sending me an O-Pee-Chee card of Tom Barrasso. 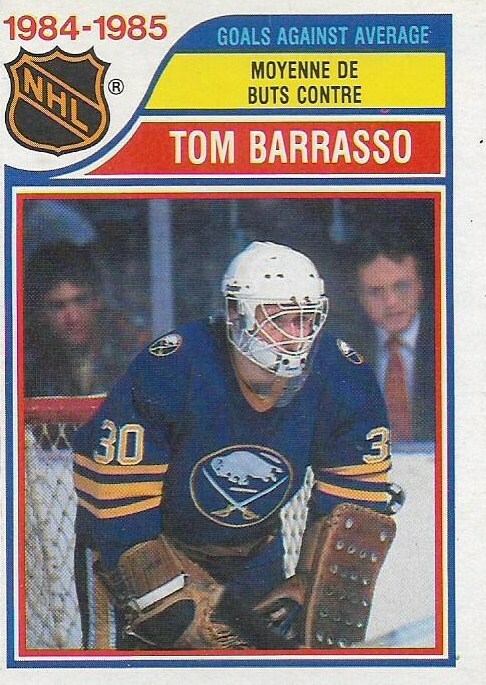 Barrasso is one of those guys I have interviewed so he will go in a special binder. This weekend I probably won't watch much football. The following weekend the NFL will start and I'll pay a little more attention. But the Bills won't be any good this year (it appears last year's playoff team was a one-and-done deal, which makes sense because watching that team last year was a little like rooting for the gazelle before it inevitably gets caught and chewed up by the cheetah). And there will be too much talk about all the things players/fans/the league/the commissioner/yours truly SHOULD be doing before/while/after the games are airing. So I'll probably just watch some baseball, which is what I'd prefer to do anyway. We've had some good times, football. But I don't think they're ever coming back. Nostalgia is a funny thing. What was once mediocre, or even disliked, becomes a sentimental landmark of a certain time and place. 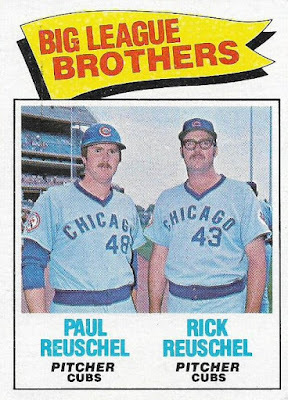 I'm one of the few baseball fans who doesn't care much about retro uniforms, but I do sit up and take notice when the uniforms of the '70s and '80s are worn by current players. These are the uniforms that I knew as "the way uniforms are supposed to be" as I was growing up, even though there is no clothing designer in the country today who would consider the Astros' tequila sunrise unis as the template for baseball wear. 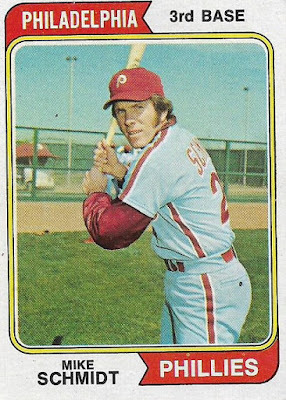 Baseball teams broke out their clothing freak flags in the 1970s and even those teams who weren't willing to go as far as the Astros, Padres, Pirates and Oakland A's, ventured into converting their traditional gray uniforms into -- *gasp* -- powder blue. The powder blue uniforms became so pervasive during the '70s and '80s that uniform traditionalists like the Yankees, Dodgers and Red Sox stood out as stodgy. Half of each league appeared to be wearing powder blue uniforms during this period. The phenomenon began with two teams in the 1960s. 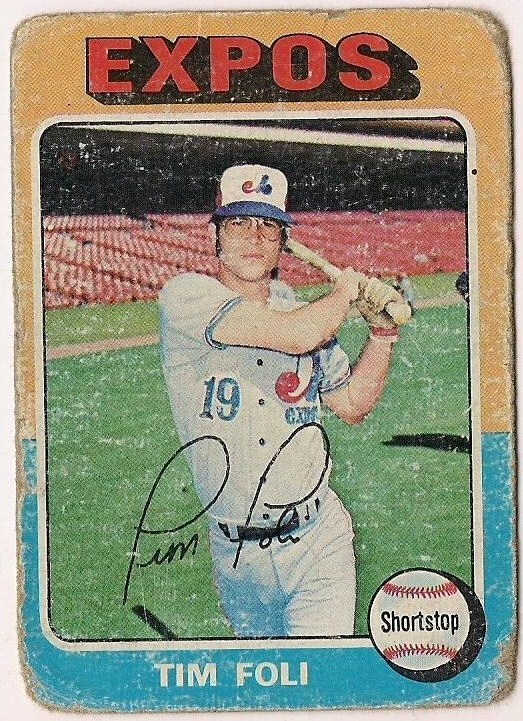 The Montreal Expos started out of the box with powder blue uniforms. Those were the road unis of choice from the very first season. 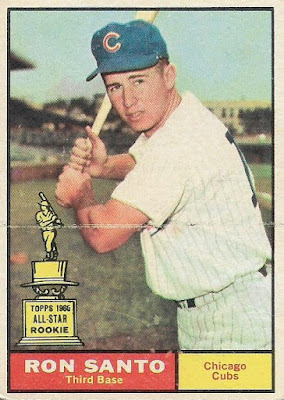 The White Sox, meanwhile, started wearing bluish road uniforms as early as 1964 (still not the first though as those who know Brooklyn Dodgers history are aware). Chicago abandoned those blue-tinged unis in the late 1960s before returning to them again in the 1970s, and then abandoning them again. 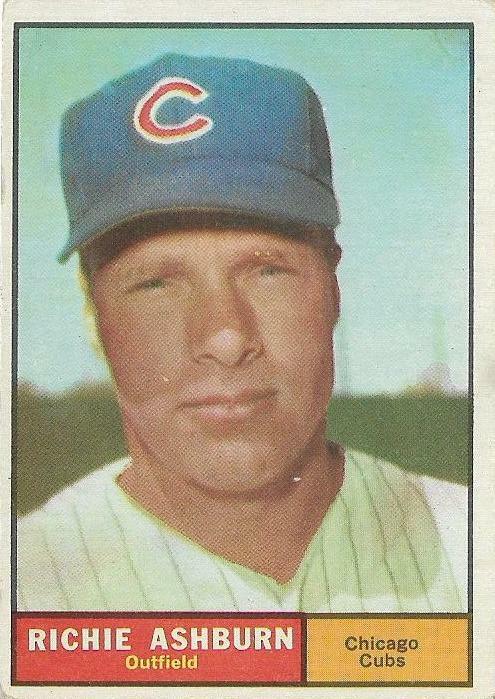 The Seattle Pilots also wore baby blues in 1969 before handing the color off to the Milwaukee Brewers. 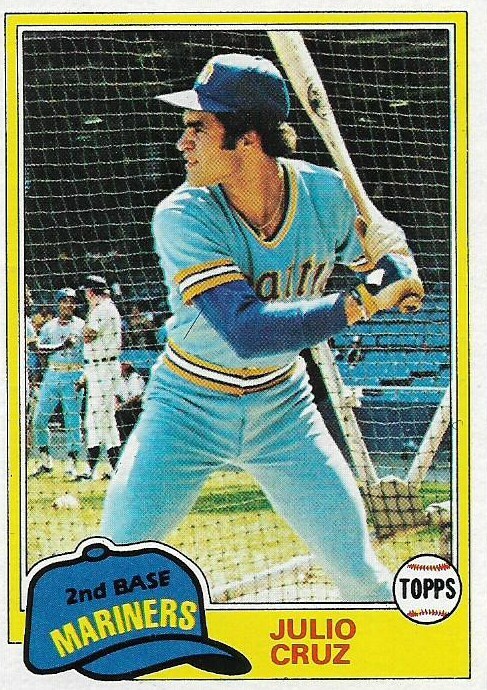 But the golden age -- or shall we say the "true blue age" -- of powder blue uniforms was the mid-to-late 1970s into the mid-to-late '80s. 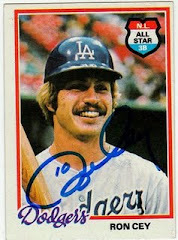 When I think back on those baby blues, which I didn't really care for and was glad the Dodgers didn't wear, I tend to think of the late '70s and early '80s. But I wanted the cards to confirm it. How many cards are showing players in powder blue uniforms in Topps sets from 1974-91 (when powder blues were at their peak in popularity)? 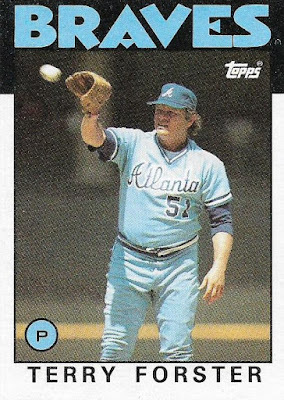 The powder blue uniforms peak in the 1983 and 1984 Topps sets, which were featuring the 1982 and 1983 baseball seasons, respectively. That makes sense to me. 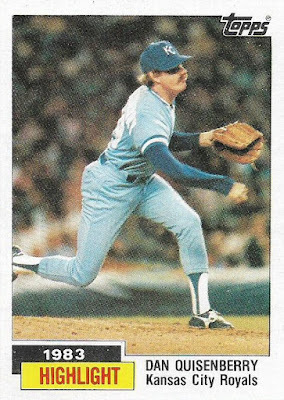 If I had to pick THE powder blue uniform year of all years, it would be 1982, and part of that is because the 1982 World Series was the second all-powder blue uniform series in three years (1980 being the first). My counting is probably not super accurate just because the photo quality wasn't great in the mid-to-late '70s (there are some cards, such as the 1978 Dusty Baker, in which the player looks like he's wearing blue, but we all know the Dodgers did not do that then), so I had to rely on the Dressed to the Nines site for confirmation. I let that site be the determining factor for several cards, particularly the Brewers, who seemed to wear powder blue uniforms, according to the card images, long past when Dressed to the Nines said they quit (after the 1984 season). I want to look at this year-by-year a little bit more just to get some other thoughts out of the way. The 1974 set reflects the addition of the first '70s teams to wear powder blue uniforms aside from the White Sox, Expos and Brewers. Those teams were the Phillies, Royals and Twins. The Twins went with a pale blue that sometimes makes it difficult to determine on cards whether they are wearing powder blue or gray. But the Phillies and Royals dove in full force with bold baby blue. 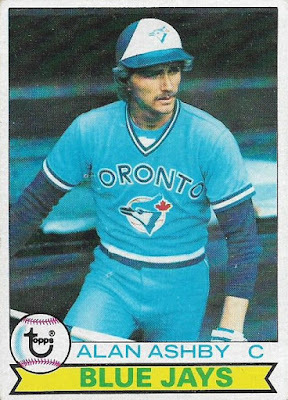 Those two teams, probably right along with the Blue Jays, are the ones I most associate with powder blue unis. They made up the first all-powder blue World Series in 1980 and the Royals were one of the last teams to stop wearing powder blues in 1991.
Who are the powder-blue crusaders? The ones who appear consistently in powder blue? Whose card career is basically defined by their powder blue get-up? 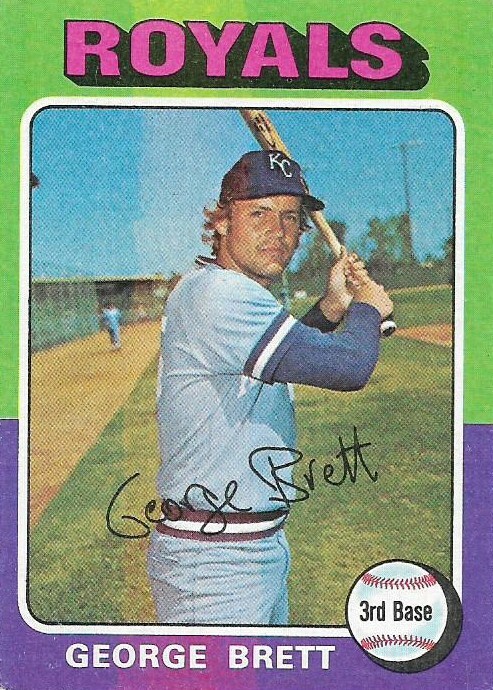 George Brett has to be right at the top, wearing powder blue on his very first card and then still wearing it into the late 1980s. Others that I noticed over and over: Brett's teammates Frank White and Hal McRae and catchers Bo Diaz and Alan Ashby. The powder blue uniform became such a way of life by the mid-1970s that Topps even color-coded its design around the powder blue for certain teams in the '76 set. 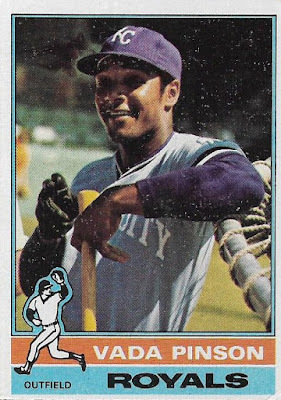 The Royals feature that beautiful Houston Oiler Luv Ya Blue color on their cards -- see how well it goes with Vada Pinson's card. 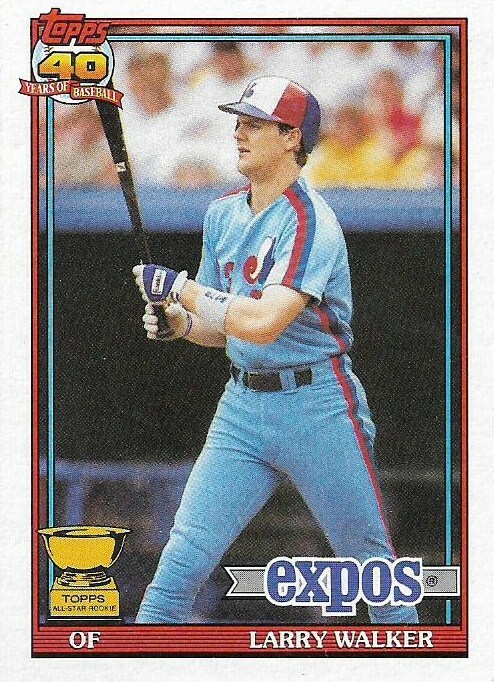 And the Expos feature a lighter shade of blue for the name bar. 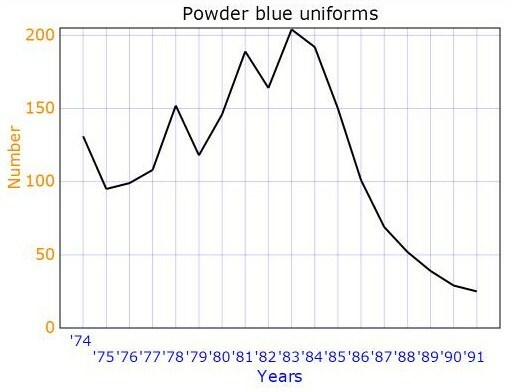 The number of teams wearing powder blue road uniforms expanded greatly in 1976. In the American League, the Rangers joined the crowd. 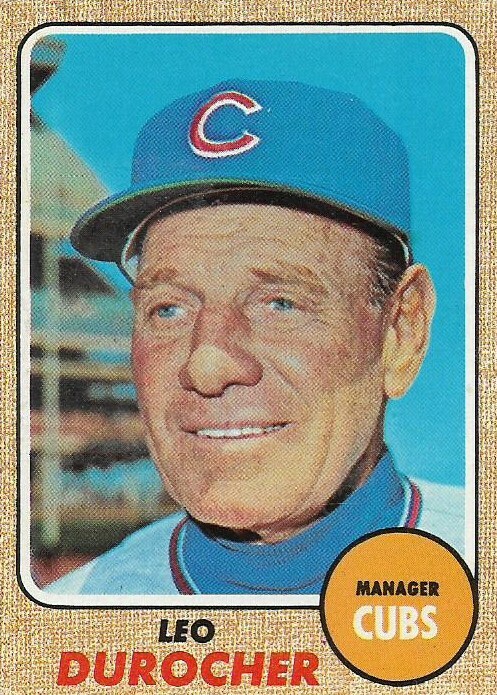 In the National League, the Cubs and Cardinals added the color as well. 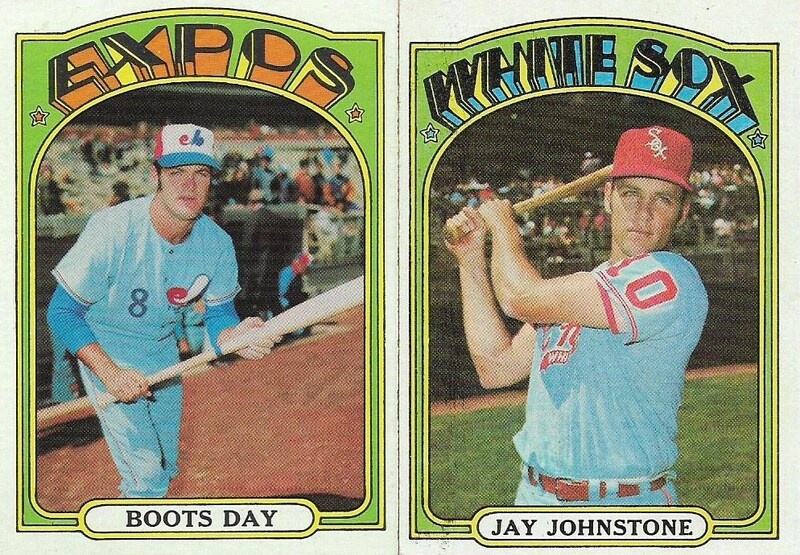 Their uniform updates are all featured in '77 Topps. The 1977 Topps set also marks the first time that a player was airbrushed from head-to-toe into a powder blue uniform as Topps took a photo of Doyle Alexander wearing Yankee pinstripes in Yankee Stadium and added blue whitewash to make him look like a Texas Ranger. 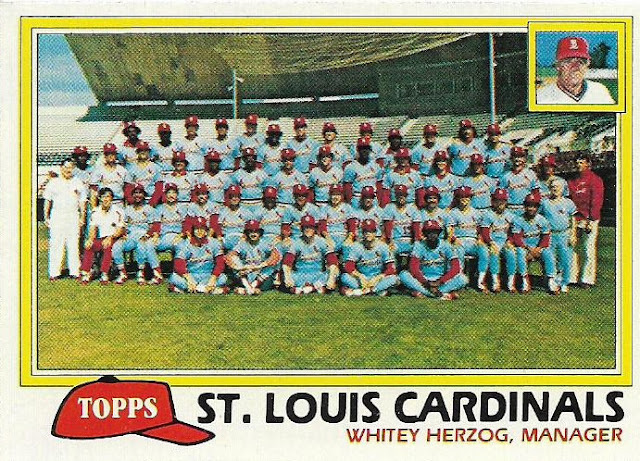 I didn't think I could find a shot of an entire team in powder blues. The powder blues were used as road uniforms and who poses for their team picture in road uniforms? Well, the Cardinals do. Because it's the Powder Blue Era. Look how proud they are. And look how sad Whitey Herzog is because he's wearing white. The 1983 set marks the dawning of a new kind of wear: softball-top jerseys. Best as I can determine, these debuted in MLB in 1982 as they are all over the 1983 Topps set. 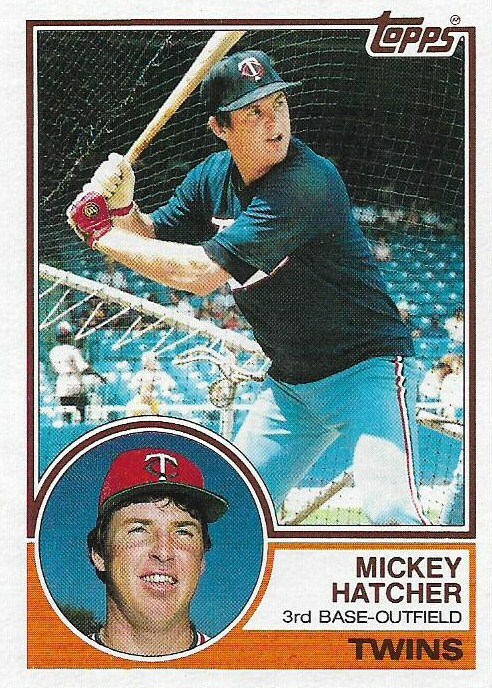 (Here, Mickey Hatcher wears his top untucked while taking batting practice -- don't let Joe Simpson see this). The softball tops would eventually overtake wearing powder blue uniforms. But for one glorious period in the mid-1980s, teams mixed-and-matched their softball tops with powder blue bottoms. 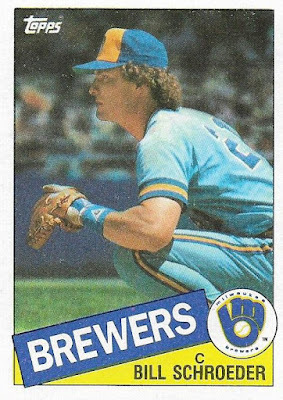 The 1983 and 1984 sets show the most powder blue and the '84 set gives you a taste of what's coming with the very first cards in the set. 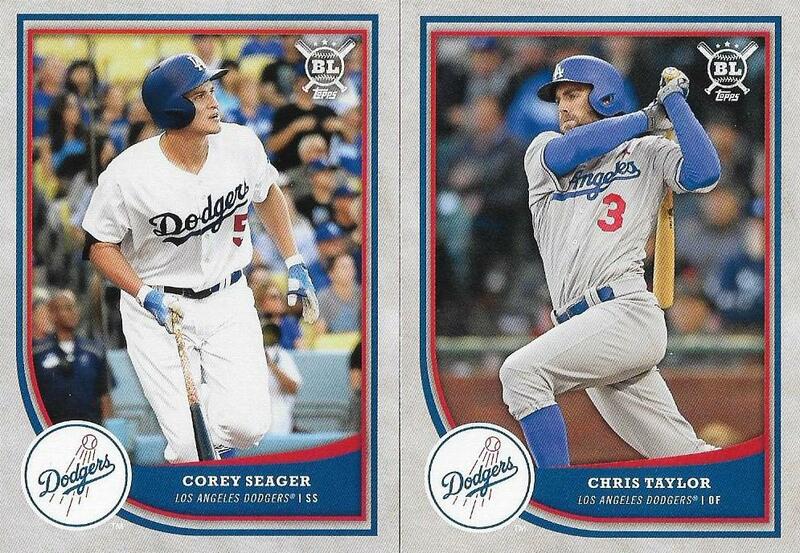 Cards #1 through #6 are season highlight cards and there is someone wearing powder blue on all but one card. Rickey Henderson, because he's Rickey, is the outlier. The '85 set marks the end of the powder blue era for several teams. 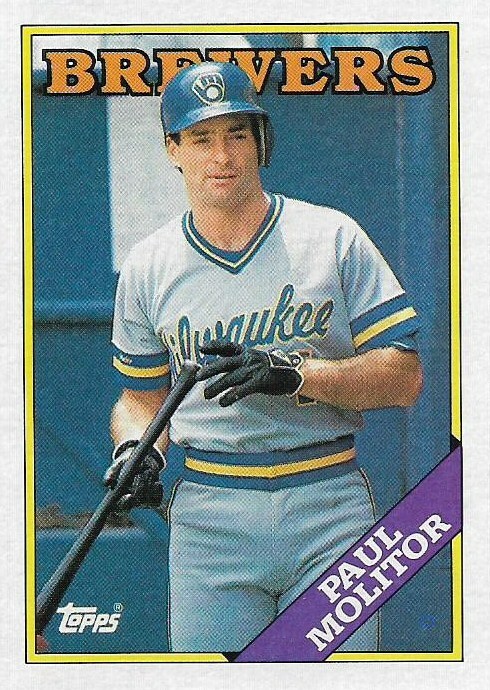 According to Dressed to the Nines, the 1984 season is the final year for Milwaukee, St. Louis and Seattle wearing powder blue (the Cubs stopped after 1981). It gets tricky after that for some of those teams, though. Dressed to the Nines will tell you this is not powder blue. Must be an optical illusion. Fat tub of goo in powder blue. Possibly the greatest powder blue card of all-time appeared in the 1988 Topps set. 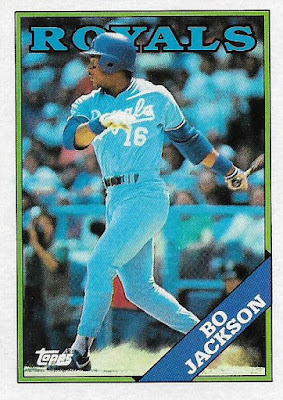 There were just 52 powder blue cards in this set, but that's probably because everyone was scared to wear it after seeing Bo and this card. By the 1991 season, only the Expos and the Royals were wearing powder blue uniforms and then they quit doing it after that season. I didn't bother going through the 1992 set, partly because it's not complete and I don't have time to look at all those cards online. Today, you only see powder blue uniforms on some sort of retro night. Honestly, I don't really miss them, even though I grew up with them. 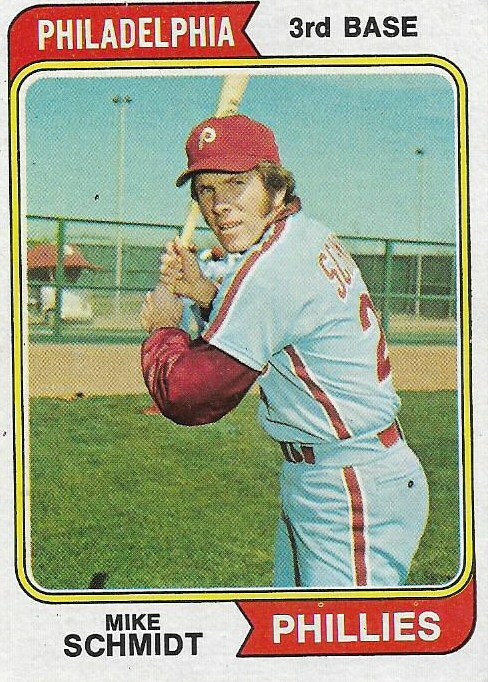 And the modern ball players somehow just don't look right wearing that uniform style that is now 30-to-40 years old. I probably should like those uniforms more considering how much I liked the Houston Oilers because they wore that color in the late 1970s. But then Earl Campbell wasn't draped head-to-toe in it. I'm hoping that this happens to some other team collectors besides me. I'm always thrown off by combo cards. Those old standbys of the 1950s and 1960s, resurrected about 10-15 years ago in a much less friendly fashion, prove to be elusive when I'm trying to complete my Dodgers team sets, mostly because I forget about them all the time. Take this wonderful item, which was sent to me by Jeff at Cardboard Catastrophes. 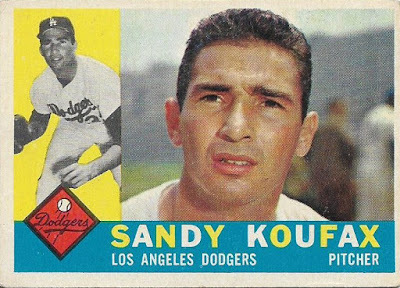 Not even a month ago, I was convinced that I had gotten down to a single Sandy Koufax card to complete my 1958 Topps Dodgers set. It was a semi-triumphant moment. All of that work was well worth it to get within a Koufax of completing the '58 set. I boasted about it in fact. A few times. All the while, my want list was shouting at me: YOU STILL NEED RIVAL FENCE BUSTERS! ... HEY! ... YOU'RE MISSING NO. 436. ... IT'S KIND OF A BIG ONE. ... MAYS AND SNIDER? ... EVER HEAR OF THOSE GUYS? But I heard nothing. Because it's a combo card. They just don't register with me for some reason. Anyway, that ugliness is over because I now own No. 436. It's a rather odd card. Willie Mays is supposed to be admiring Duke Snider's bicep, I guess? And what's that mess on Snider's cap? 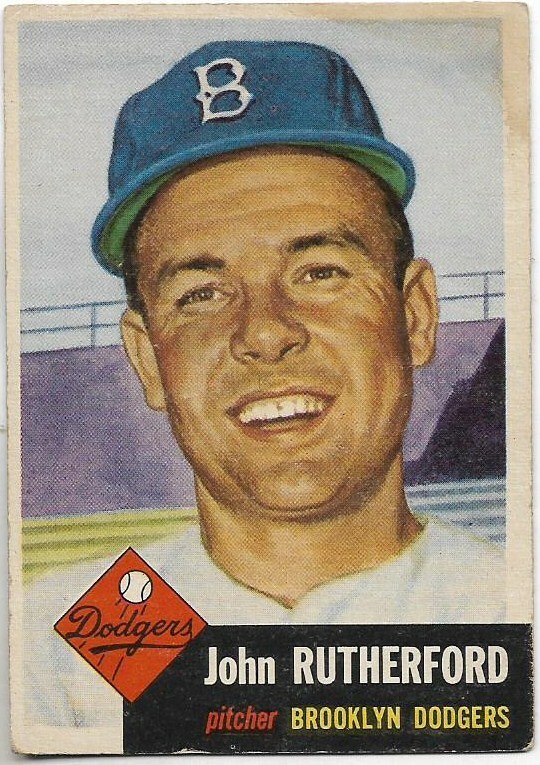 Topps is famous for scrawling in the "L.A." on the Dodgers' 1958 cards but that thing is a muddle. Still can't beat two titans of the '50s on one piece of cardboard though. 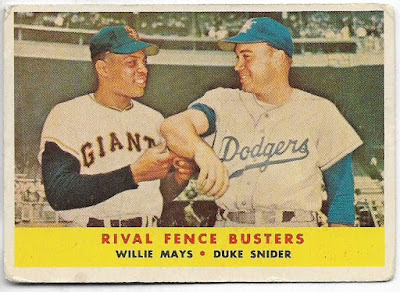 And you can't beat that title: "Rival Fence Busters." Fence Busters! Why don't we still talk like that? We should talk like that. Can't believe I forgot that card. 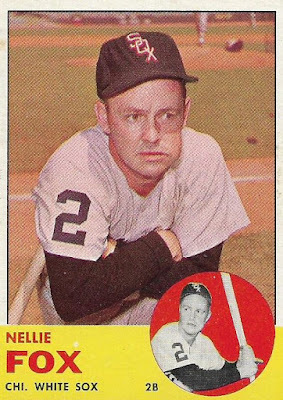 Jeff also pulled this card out of the discount box (I'm going to assume these were found at The National, as I know he went). It was a need from my 1953 Topps Dodgers list. It's almost the last non-name player from that want list. It's all Robinsons and Podreseses from here on out. 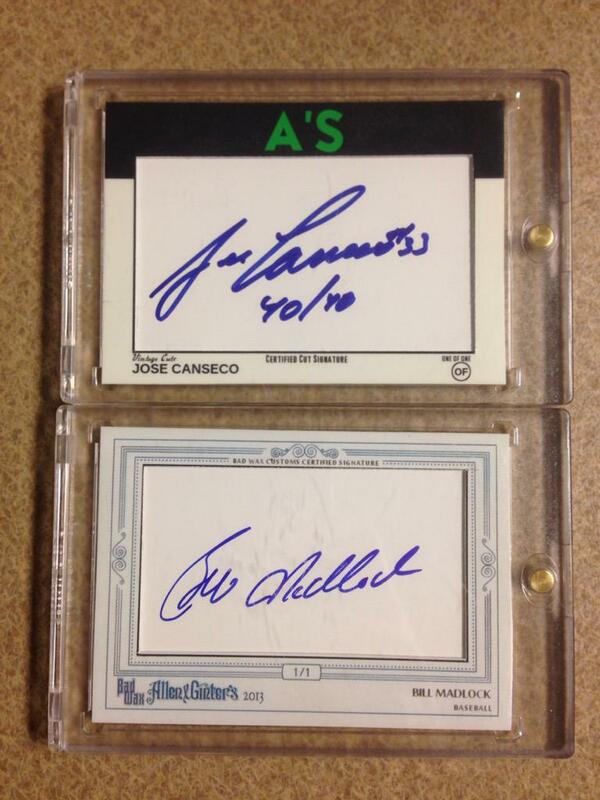 These two cards are much appreciated and the perfect condition for the '50s cards I own. 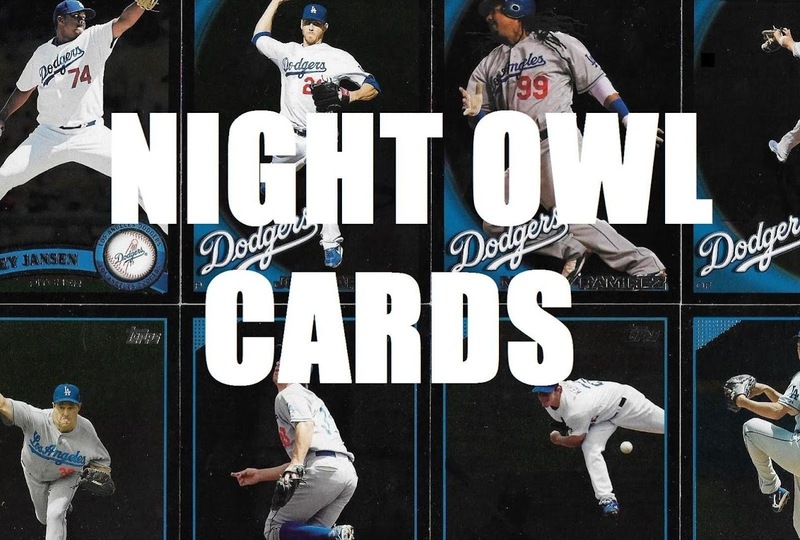 They'll be nice and neighborly with the other cards in that portion of the binder. And now .... NOW ... 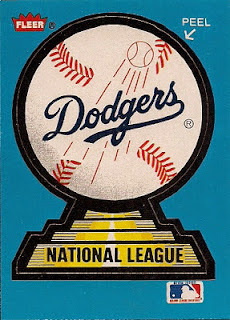 I need only a Koufax card to complete the '58 Dodgers team set. 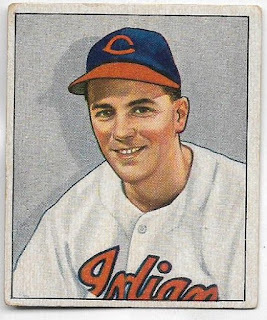 My card collecting friend R.C. sent me a few cards recently. He said he didn't have a need for them and hoped I might find them useful. Let's see the breakdown with pretty pictures. This was not the only legends short-print in the package but it is the only one I will definitely keep. The 2009 set was the first one to add short-printed legends cards, I believe, and I remember the carefree days when this was a new-and-interesting concept. 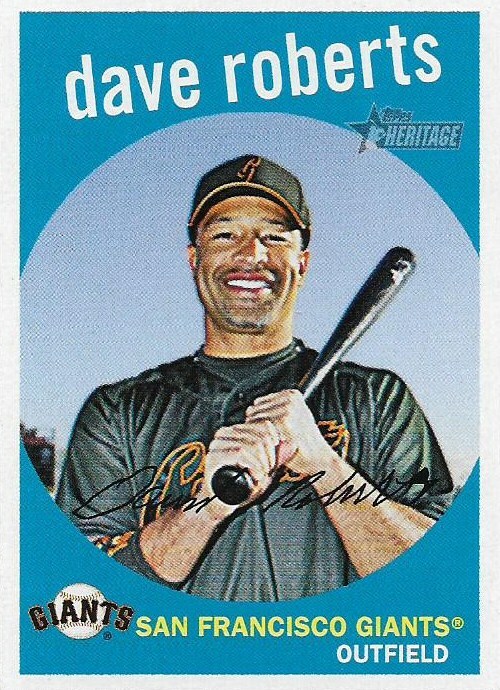 Plus, the 2009 Topps set is the first one I completed after coming to blogging. 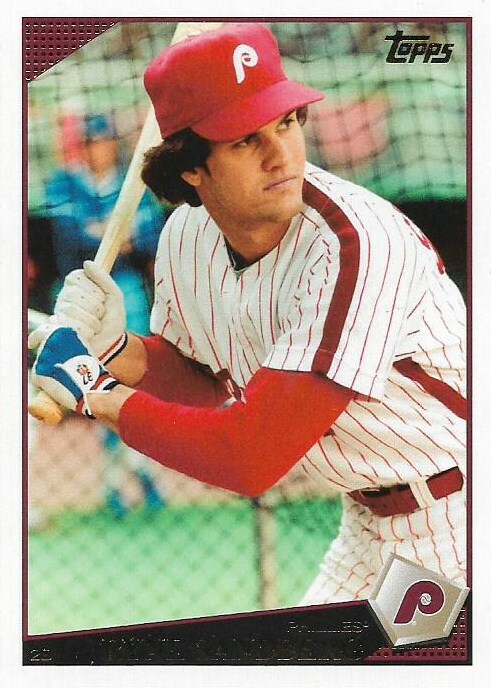 And you can't beat seeing Ryne Sandberg in a Phillies uniform. These are each upgrades. As a proud 1970s card collector, I've taken care of these sets already. But I am so happy to see a 1978 Nolan Ryan that wasn't mangled by a 12-year-old me. I've never upgraded it because '70s Ryans are too expensive. Once I've upgraded these, the old cards will go into the future giveaway, although I don't know who will want my old Ryan card. Yes. Send me all your uncracked 1970s Kellogg's 3-D cards. Look at that thing! It's immaculate. 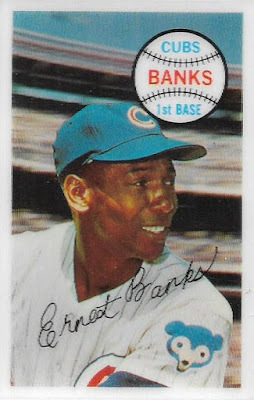 I don't have any intention to try to complete the 1968 Topps set, but every time a '68 card comes my way I try to hang onto it, just because the first old cards I ever obtained were from 1968 and 1969. 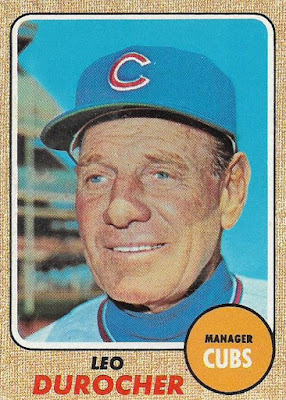 You can't beat the opening on the back that says: "The colorful and provocative skipper of the Chicago Cubs is one of the most exciting men in baseball." 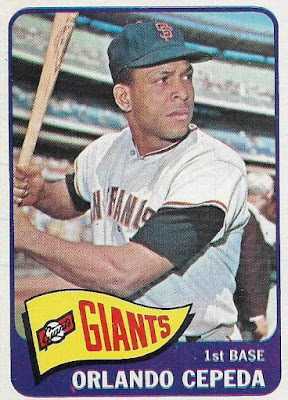 Have I ever mentioned that the purple used on the Giants and Twins cards in 1965 Topps reminds me of the gross medicine I took as a kid and that is why I've never seriously thought about collecting the 1965 set? You think I'm weird now, don't you? I think I'm weird, too. But what would really be weird is getting rid of an Orlando Cepeda card because it reminds me of the gross purple medicine. I'm not that weird. 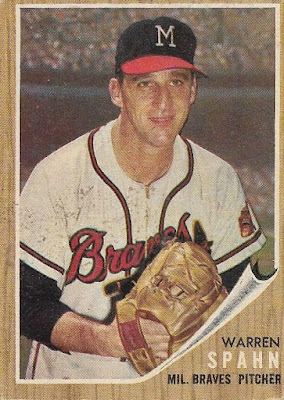 Holy heck, I don't actually need to justify keeping a card of Warren Spahn do I? 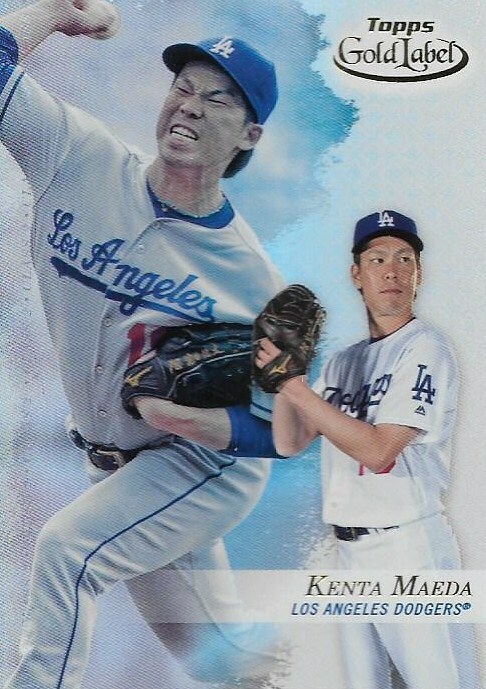 Now, I'm not saying I WILL trade this card. 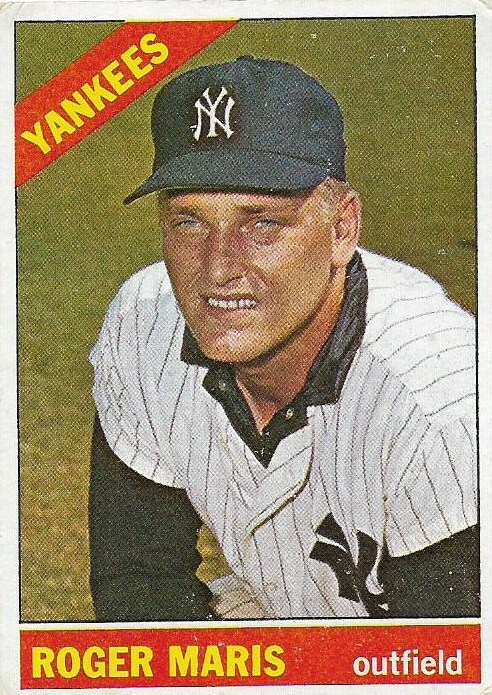 I'm just saying that I've never been fond of the 1966 Topps set nor the Yankees, so you never know. And if I remember that I now have three of Maris' 1960s Topps cards then I may never trade it. This is what's known as a double-chaw card. How many of those are in existence? Want this card? You might have to find a triple-chaw card to exchange for it. That's some good stuff, especially if you like the Cubs (R.C. does). 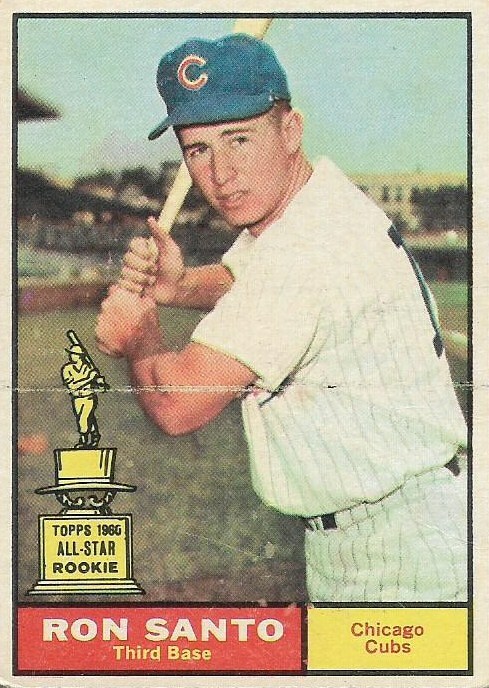 They don't necessarily fit my collection except in the general "what kind of nut job doesn't want cards of 1960s stars?" way. So, again, I'll happily hang on to these. Hi there. 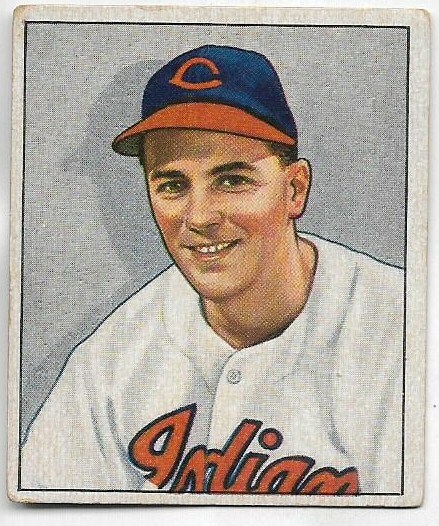 This is a 1950 Bowman Lou Boudreau card. Find me a Dodger I never thought I'd ever own and this is yours. There are actually two other cards from R.C. that would qualify as Traders but they're already in transactions. That's how useful these cards have been already. Well, here's the thing about giveaways. I kind of want them to be a surprise. 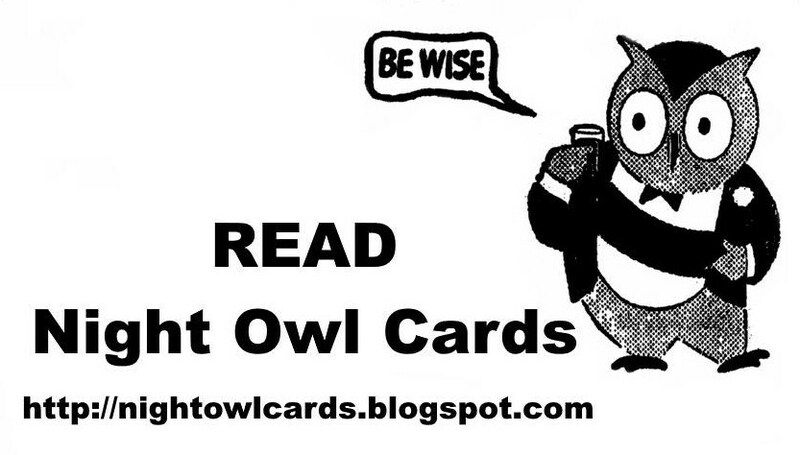 So I'm not going to show any of the cards that are designated for the giveaway. You'll just have to wait. 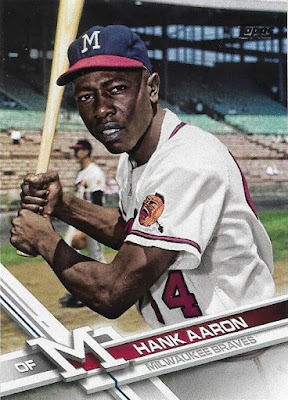 That's a Hank Aaron short-print from last year's Topps set. Each year I notice a malaise that settles over the blogging community during late August. I'm not sure why that is. My guess is vacations come into play. In some areas of the country school has started up (which still strikes me as bizarre). Perhaps some folks are a little tired of baseball -- their teams are fading, the NL playoff contenders are a collection of gross -- and they can't get interested in cards. This is usually the time of year when everyone fails to comment on one of my posts, a rarity as a post earlier this week was the first in almost two years without a comment. And yesterday I kind of opened my heart and the clicks were, well ... weak. But I knew all this. That is why I had planned to start The Greatest 100 Cards of the '80s countdown in August, specifically the end of August. Maybe I could generate some interest among bored collectors. However, life has conspired all summer to prevent that from happening and with everyone apparently too busy to read blogs why start it now? 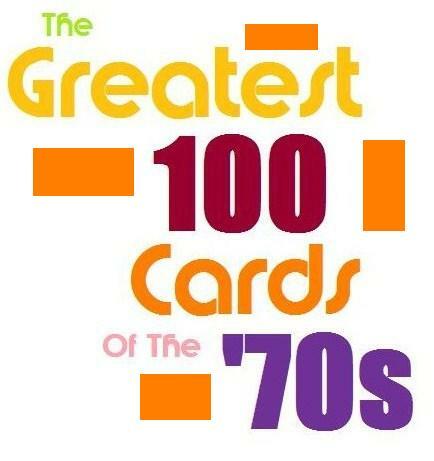 The countdown is now moved to September, which is when I started my Greatest 100 Cards of the '70s countdown last year. Seems like the right time for it. Instead, today, you lucky few readers, I have a few cards from Marc at Remember the Astrodome. FILL MY SERIES 2 DODGERS BASE CARD NEEDS, DAMMIT!!!!!!!! Why is this so hard? When I tell you I'm done buying packs of Series 2, this means send me all the Dodgers left on my want list!!!! I'm down to a lowly Kyle Farmer card to finish this thing off. Who's going to earn my undying gratitude by sending me that card? 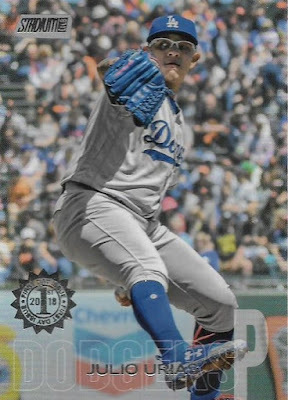 Marc also contributed to my progress on the Big League Baseball Dodgers team set. Still a few guys to land from this one. Not too concerned though. It's not the travesty that is Series 2. 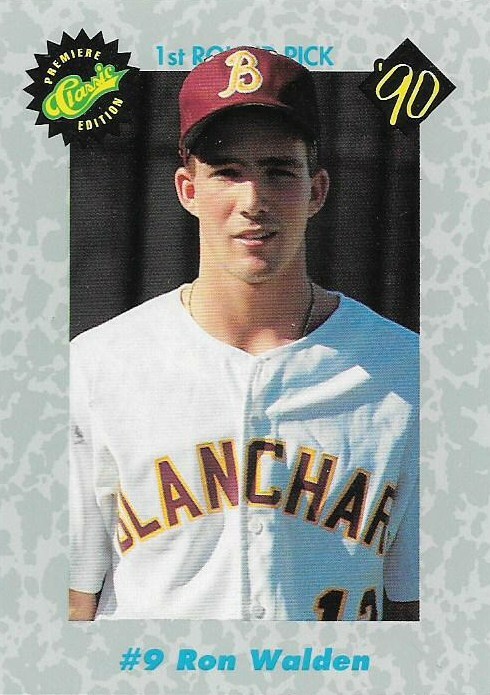 Marc also threw in a couple of parallels. The blue Turner is my first look at this parallel. It's very 2005 Bazooka. Moving on to this year's Stadium Club. 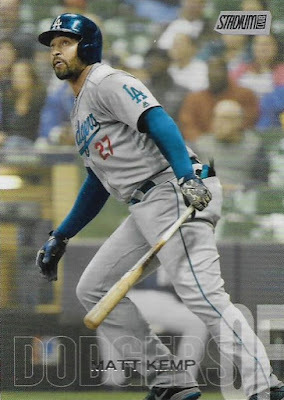 This Matt Kemp card was a need. The image shows signs of photoshopping. Helmet color is off. The red number is too small. Dodgers script looks ironed on. Kemp is too fat. This obviously is a Braves photo. 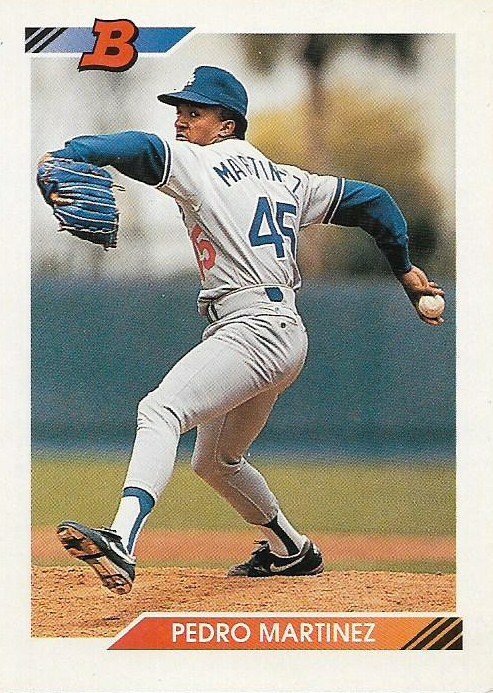 Marc also sent one of those First Edition parallels that '90s fans get all worked up over. 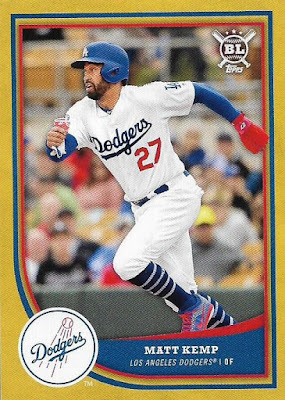 It means little to me, it's just a dumb stamp, but I do admit it's the first time I've seen one of these since the Stadium Club reboot began in 2014. Finally, Marc added what he called a "double-bipping" into the envelope. 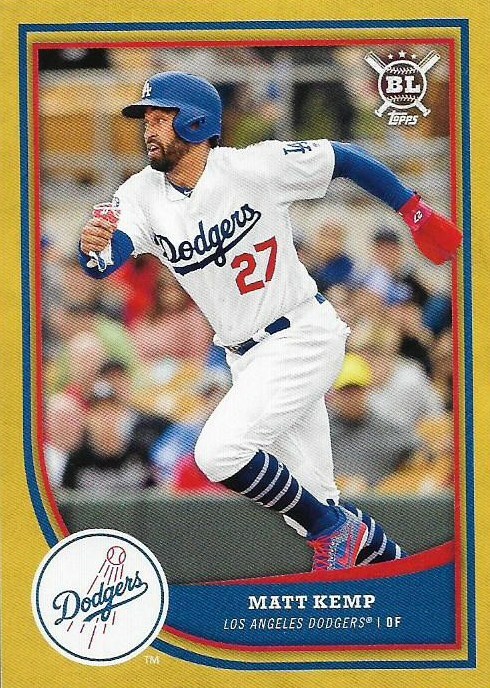 I admit I never realized that Bip Roberts was getting retired at second base on two Dodger card in the '91 Fleer set (the Padres stink). 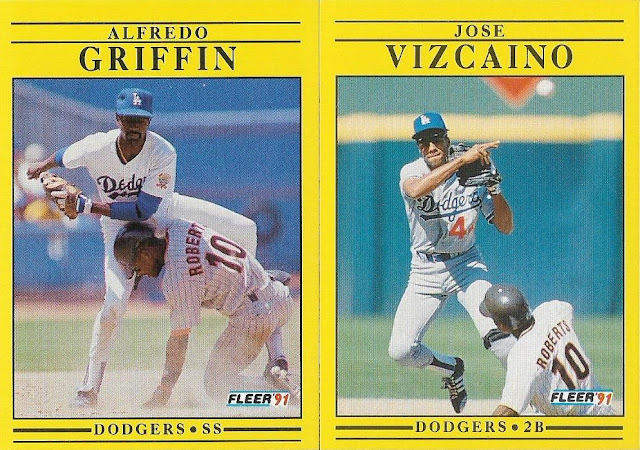 I can't believe I've missed this completely (But I tend to squint when viewing '91 Fleer for some reason). Well, that's about it for today (and probably tomorrow). I have to admit, writing for no one isn't as interesting as it once was. 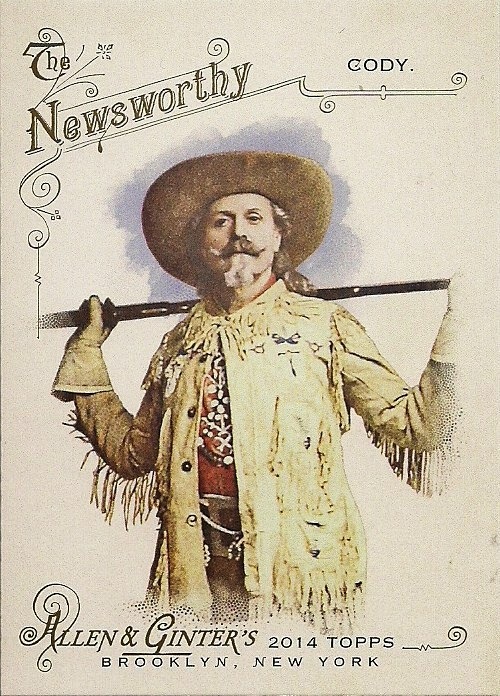 But I know that once August is done, readership will pick up a bit again. It always does. (Then there's usually another dip in November). Thanks to those of you who are reading. Stay tuned for the Greatest 100 Cards of the '80s. 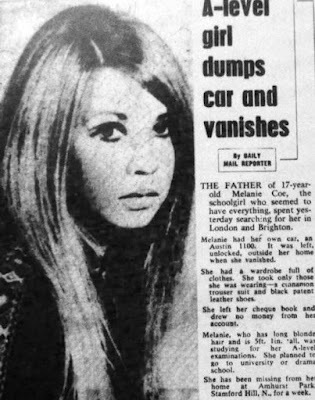 The lyrics for the Beatles classic, "She's Leaving Home" were drawn from a newspaper article about a 17-year-old girl, Melanie Coe, who seemingly received everything from her family but ran away from home. Although the song is about a teenage runaway amid the '60s counterculture, it has since become an anthem for parents whose daughters leave home for college. Guess what I just finished doing for the first time? Saying goodbye to your barely-adult daughter amid the whirlwind of moving her into a new place (amid many other adults doing the same thing) and then taking off for the four-hour trek back home may not be as gut-wrenching as wondering where your runaway child is, but it was a strange mix of proud moment and heartbreaker that no one can know until they experience it for themselves. I'm doing OK (my wife on the other hand ...). But I've found myself reflecting plenty over the last week or two. And it's taken a weird form when it comes to my hobby. As I've come closer and closer to realizing that I will miss my daughter for the rest of my life, in that perpetual state of "missing," I've been seeking out missing cards in my collection. Before we dropped her off at college, I instinctively filled up my online cart with Dodgers inserts from the previous five years. These are those annoying little "extra" cards that I forget about and that progress deeper and deeper into the recesses of my brain until I barely miss them anymore. But, dammit, no card is going to go neglected if I need it. Now that they're in my cart I don't "miss" them anymore. I may not have them, but at least I know where they are, in my online cart, dammit. Kinda like my daughter. She's not here, but I know generally where she is. 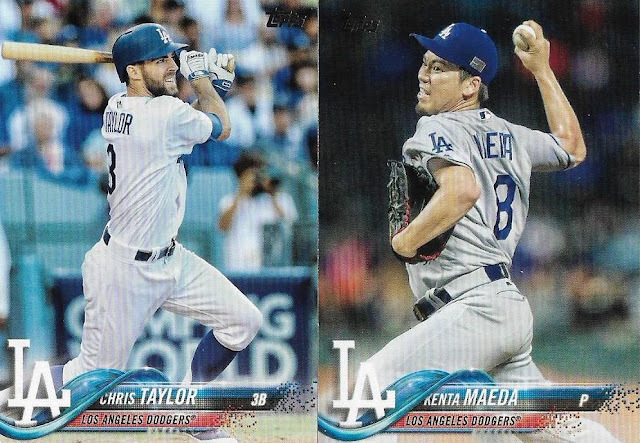 Yes, I have the Sandy Koufax card from this set, but not these other two guys. 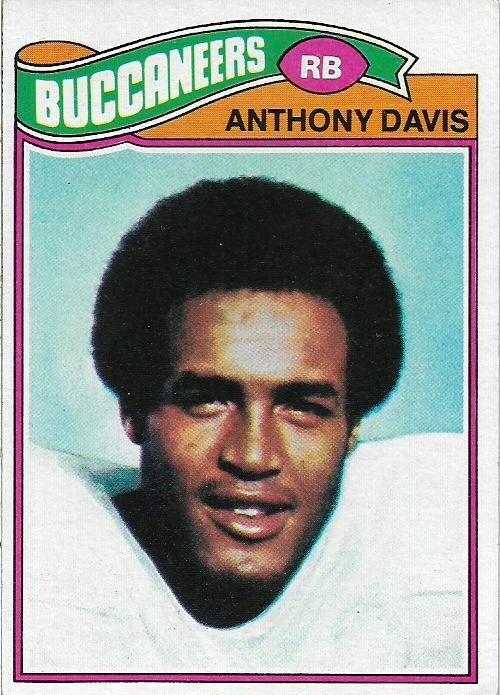 Davis' card is his rookie card and a high number, but it can be found relatively cheaply. Same with Snider. It's time to round these guys up. This has been gnawing at me since probably before my daughter picked a college. The '92 Bowman cards are not exactly rare but are notable for being one of the few sets from '92 that is coveted. So, while I have Piazza's rookie card and the Pedro Martinez card from this set, I'm still missing stalwarts like Greg Hansell and Jamie McAndrew. Time to round them up. Can you believe I own the Mike Piazza All-Star insert from '95 Ultra -- the Mike Piazza gold medallion (silver medallion?) 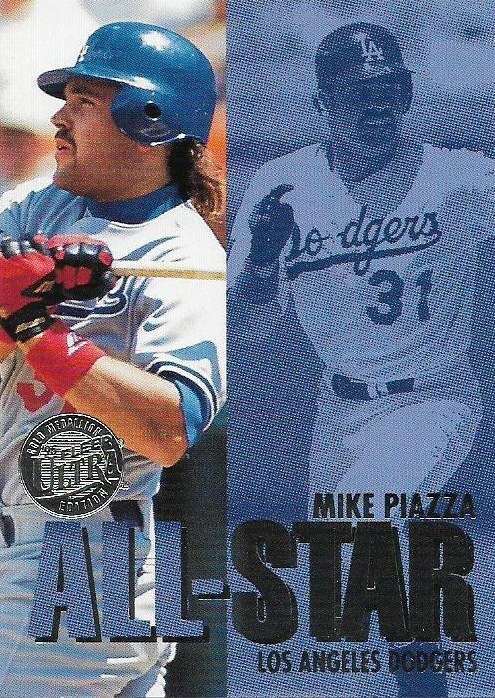 insert from '95 Ultra -- but not the regular old base card! Throw it in the cart! This one goes out to my daughter! 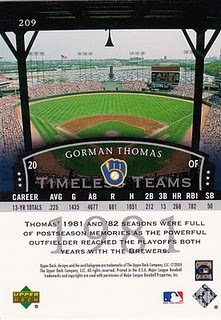 The Timeless Teams set, while attractive and fun for retro collectors, is typical Upper Deck bloat. There's no real need for multiple cards of various players in the set. 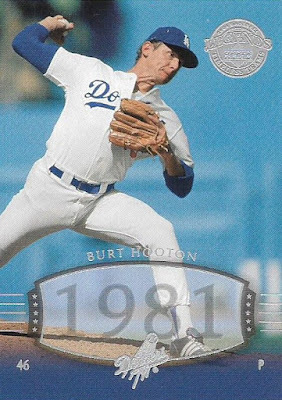 Two Burt Hooton cards? Why? Maybe so I can own one of them and still need the other? Let's end that nonsense! This nastiness has gone on too long. Thanks to Heritage's short-printing ways, I've been sitting on an almost-complete 2008 Heritage set for a decade. The references in this set are so old that they now approach bizarre. Dodgers manager Dave Roberts as a Giant? Whaaa? I am missing 11 cards of this weirdness to finish it. Short-prints or no, I'm throwing them in the cart. Perhaps by the end of my daughter's college career I'll have gathered up all those missing cards. 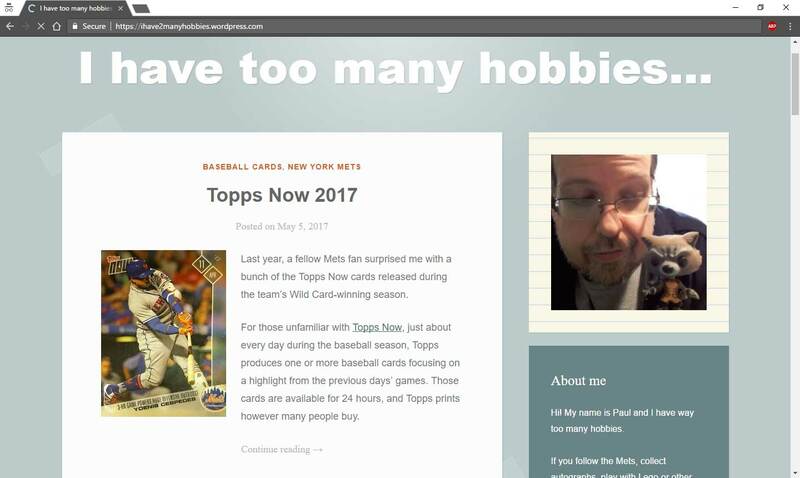 It's been a tough few days saying goodbye to someone who has meant so much to me that I've even incorporated her, a non-card collector, into a blog post or two. There probably won't be much of that anymore now that she's so far away doing her own thing. I'll just immerse myself in my hobby to take my mind off of it.